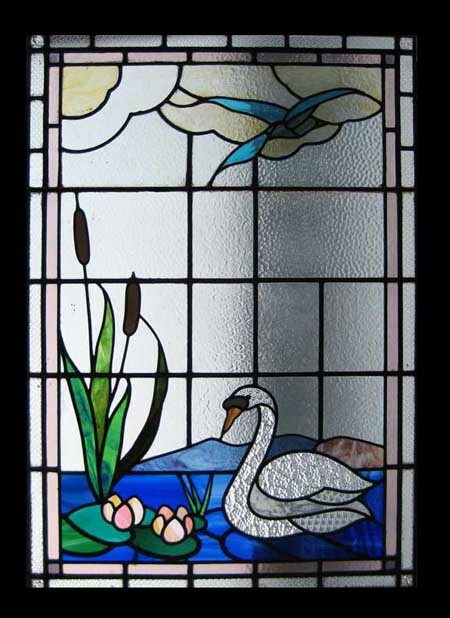 This beautiful old window has outlived its original frame and has been reframed in a substantial new pine frame. It was removed from a house in THE STUNNING COUNTY OF LANCASHIRE ENGLAND. 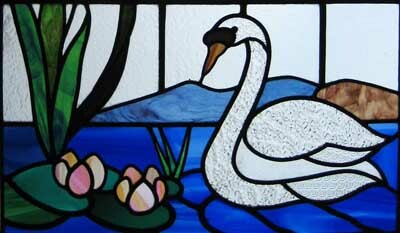 Beautiful SWAN FULL OF GRACE WITH WATERLILLIES AND REEDS- A PIECE OF IMMENSE BEAUTY. The frame measures 35"W x 49 1/2 "H The glass measures 32 " x 46 1/2" Shipping and packing for USA would be $399 Including full insurance for loss and damage. You can buy this now using the paypal link below the photograph or e-mail sales click here to arrange payment by personal check ,money order or bank transfer.